This December, the irresistible force meets the immovable object. It’s the clash of the titans; the war to settle the score. 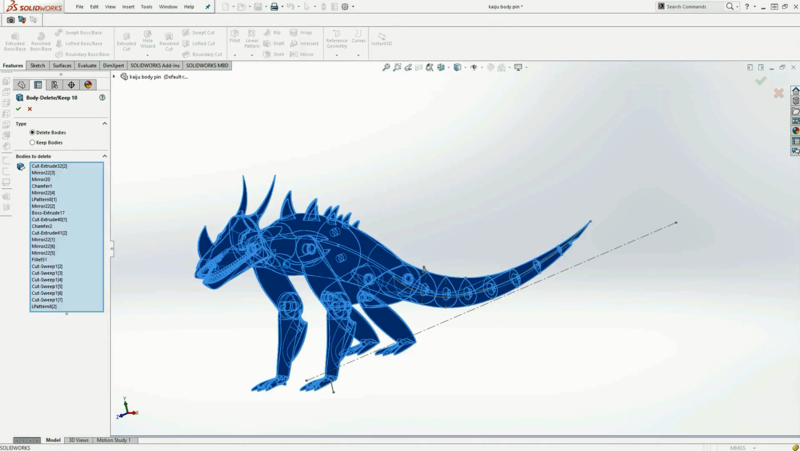 It’s Kaiju vs. Mech in a winner-take-all battle pitting a massive monster head to head against a giant machine…and it’s going down in SOLIDWORKS Simulation. Since our Ice Age ancestors did battle with wooly mammoths and saber-toothed tigers, the idea of battling savage beasts is well-entrenched in our DNA. This fascination has lent to several popular culture phenomena over the past century from King Kong and Godzilla to Cloverfield and Pacific Rim. And how does mankind respond to an all-out assault from these monstrous marauders? Air power was the weapon of choice against King Kong, but the more fantastic earth defense strategy has to be creating massive human-piloted machines called mechs (you can actually read about SOLIDWORKS user Jonathan Tippett, who is creating a real-life mech in this blog post). In order to prepare mankind for a potential kaiju attack, the tech team at SOLIDWORKS assembled to test just how a mech would hold up in a fight (hey, anything is possible these days). Some questions we wanted to answer included how the giant robot would stand up to seismic activity created by a monster emerging and stomping around the earth, what a collision would do to our mech, and how can a restraint be designed to stop a kaiju in its tracks? Naturally, we fired up SOLIDWORKS Simulation to answer these questions in a two-part video series that you can preview below and view in their entirety by clicking here. In addition, we wanted to take you behind the scenes to see how these models were designed and eventually 3D printed. What’s cooler is you can actually download the models and print out a version for yourself or that special robot/monster fanatic in your life. You can see time-lapse videos showing the design and printing project by clicking here for the kaiju and here for the mech. Another cool activity you can do after downloading the models is taking advantage of the eDrawingsAR feature. 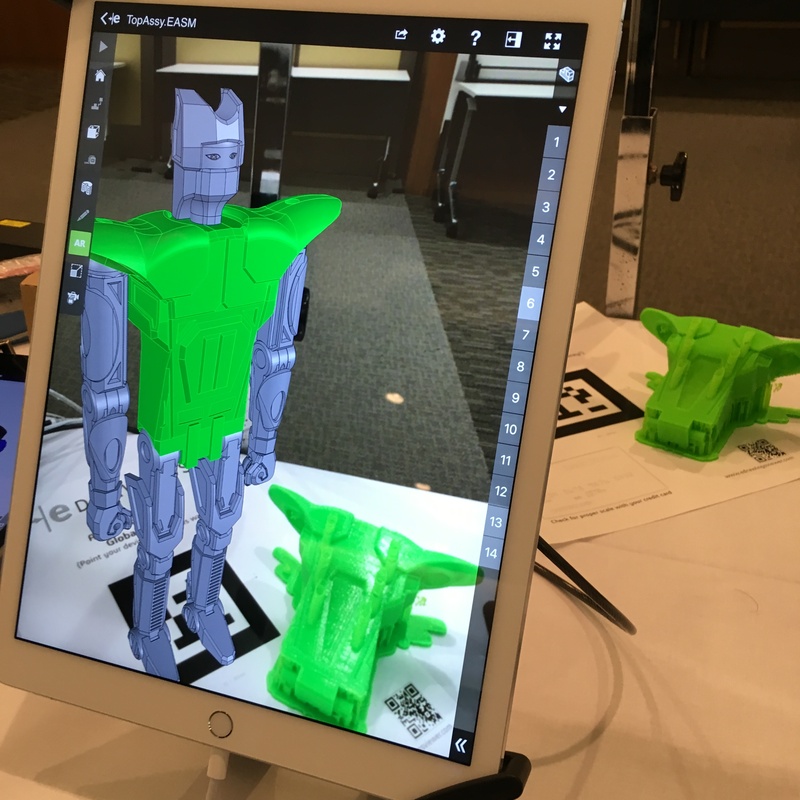 The team from SOLIDWORKS Japan recently did this at SOLIDWORKS World Japan and the end result of seeing the mech standing on a table was awesome. If you decide to make your own prints or display the models in eDrawings, send us a picture. It’s the perfect time of year to have some fun – you deserve it. Click here or the below banner to start your kaiju vs. mech brawl for it all.